I just made my first Turning Twenty Quilt. I loved it! I have only started quilting about three years ago when my husband gave me a machine and said he wanted to see a quilt made. I have since made about 6 or 7 with about 5 in various stages of completion. I am addicted to fabric and fabric stores and I am always buying fat quarters. While visiting my mother-in-law this summer, I went to my favorite fabric shop and the lady showed showed me your book one day and I went home with the book "Turning Twenty" and 20 fat quarters. 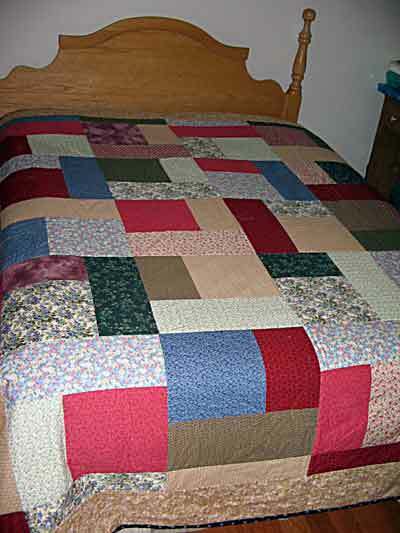 I then kidnapped my mother-in-law's sewing machine and within the week had the quilt completed. I just loved making it and will quilt many more of these quilts. Here is a picture of my quilt, I call it Nanny's garden, made up of patches much like the memories I have of growing up and hopefull, like the memories my children will have of time spent with their nanny Jeddore. I made as a Christmas gift for my mother this year.